Featured Blog #18. I am so proud to present to you the FBW's featured blog. At last, Papaleng and his Amazing Animals, agreed to be featured here. Blog Description: Some surprising, amazing and interesting animal facts! About the blogger: Just a funny man who simply loves poetry and Nature. How did he get into blogging? I started as an article writer in some paid writing sites. A dear Triond friend suggested that I create a blog and post my published articles there. It's just like 'hitting 2 birds with a single stone' -- a published post earns both from Triond and my blog. What do you think is your biggest struggle as a blogger? I know little about the so-called SEO things. What is the inspiration behind her blog and how long has it been around? It was May 23, 2011 when I posted my first My first Amazing Animal article. Inspiration? I see God's greatness by simply watching those animals. Every single breed is so unique eh. What is his favorite blog post and why? Endangered Species of Butterflies. It is the first article that got a 5-Star rating at Stumble. Also, the first viral article I have. As of this writing , it still gets decent traffic and was viewed by more than 100,000 internet users. Where do you see your blog(s) years from now? That, I can't tell, but the sure thing is, my articles caters to students and education is forever. How does blogging help you financially and career wise? Not that much in the financial aspect, since foremost I write for passion lang. Career? Perhaps pogi points on my writing portfolio. Also, I am a certified online celebrity na. Just kidding. Advice/tip you can give to new bloggers to succeed in blogging. Write on things you know much. Write quality and original posts. No spin articles. Always set writing goals. Be it a post a month or 20 posts a day. It doesn't matter. If you are writing for 'bucks sake', be diligent enough promoting your stuffs. Join social forums and be an active members. Always ... give a helping hand to your fellow writers and bloggers. Papaleng always writes fun things I love to read. :) I also wrote on Triond and started blogging from there. 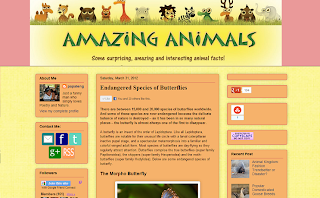 I like his blog so much that I have learned so many interesting facts about different animals. It's Papaleng's turn. He's very helpful especially sa stumbleupon. this kind of blog deserve to be spread out. .alam naman natin sa panahon ngayon, marami ang mga hayop na naaaboso. .specially those endangered species. . .this is one way of telling people that we are all responsible to each and every living creature in this beautiful planet called earth. ..
Ang galeng ni Papaleng. Ako din personally, know very little about SEO and it's always great to hear someone who's had great success, share an advice or two to fellow bloggers. Keep it up Papaleng! Papalengs - amazing-animals is one of the blog that I think have informative contents. I read this article by heart and I like how you (Papaleng) answered the interview-like questions. Yeah that post about butterflies is epic! Love the tips especially the first two. I like reading those blog posts because I get to learn new things about animals that I have yet to hear of or know little about. Papaleng's wisdom and depth shows in the very simplicity of his answers. I like his blog because of the wealth of information it offers. Amazingly Papaleng! Congrats and well done. Your posts are even more interesting now. I have been following this amazing animals blog in a a regular FBW syndication. I love seeing those animals... I now of them are endangered ones. Keep up the good job! Congratulations to papaleng! He deserves this spot :) Gusto ko rin yung mga blogs niya! Congrats Papaleng.. I always enjoy reading your list of amazing animals, and always learn something new! Just like him, I blog just because I like, not for anything else. Getting paid for it then becomes a bonus..
and I have to agree that education is forever. I love this blog,always find something new here. Met Papaleng on Triond and he was very helpful. Has always been. His blog is very much like him: alive and bubbly and full of information to share. Congrats, Papaleng. Oo nga, online celebrity ka na. Would love to see you on TV. I am always awed by the information he shares on his blog. It's really well researched.